It’s a big ask to live up to one of the most controversial philosophical writings around, but this game was a revolution in the PS2 market and should have more fans than the often difficult Nietzsche. A game without guns and with a focus on recording species, you’d think you were in for a dull ride, but this game quickly unleashes you into a world of revolutionary journalism with the aim of toppling a corrupt regime. You play as Jade, one of very few humans in this land. With your uncle Pey’j, like many of the game’s characters an anthropomorphic animal (specifically a pig), you embark on an effort to uncover the truth behind your government. Your planet of Hillys is mysteriously under consistent attack from an evil alien force and yet your military government seems unable to stop it. It’s up to you to find out if they’re in cahoots. Your primary means of fighting back? A 35mm camera. Not digital, but manual. Bearing in mind this game is set in the future I absolutely love the fact they’ve kept it traditional. It would make no sense at all for her to have this old camera technology, but they’ve kept it because it matches the feel of the game. Hillys feels old, your hovercraft is beat up, the buildings aren’t glass skyscrapers but terraced blocks. It looks like a small town in the South of France, it’s very charming … except for the iron clad soldiers everywhere. This is not to say that the game is all charm and pretence with no action. The upgrade system on your hovercraft allows you to turn it into a fighter to be proud of. You chase down thieves and alien invaders before unleashing some old fashioned justice with your stick. This satisfying action serves to prevent the relaxed animal photography and long periods of stealth from becoming stale. The controls of the hovercraft really show up the frustratingly wild attempt by Grand Theft Auto: San Andreas. Though the demand for this is minimal at best, this game has set the bar for hovercraft controls. 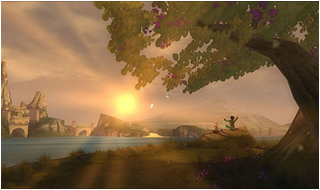 The focal point for the game’s storyline is the relationship between Jade and her friends and family. In order for her to live happily she must save her homeland. Her status as an underdog immediately gets you on her side. The banter between her and Pey’j is witty, believable, and adds to the charm of the game. These characters find humour at the most distressing times, so the game is never stale with doom and gloom, yet when something truly terrible occurs the characters quite rightly refrain from making light of the situation. You can’t help but connect with characters like this in a cultural medium which is often devoid of quality dialogue. 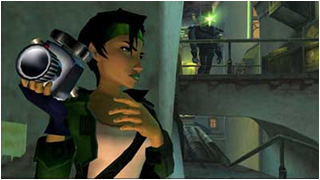 Aside from the camera controls being eternally frustrating despite changing between inverted and regular, and the more than slightly farfetched direction the game ends up going in, the pleasing soundtrack, the stealth mixed with the all-out action, and the pacifist message of the game all combine to create something truly classic in the PS2 library. A true revolution in gaming that no PS2 fanatic should be without. Great game, a real classic. I discovered this game only recently, and wondered why I had not heard much about it before, it was that good. Perhaps because the genre was too difficult to pin down, a sci-fi I spy adventure maybe?